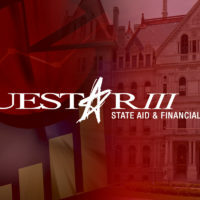 Questar III’s Communications Service helps school districts communicate with the public. The service can plan and implement a customized communications program or assist with a wide selection of special projects. This includes, but is not limited to: publications, internal communications, budget and bond materials, media relations, graphic design, web development, social media, photography and printing. Currently, we serve 20 school districts in three counties. We also provide services to the BOCES and its partner organizations. We have a staff of 11, including one director, one webmaster, one graphic designer, one communications technician and seven communications specialists. Questar III provides on-site communications service to 14 school districts. Specialists work out of offices based in the school districts they serve, but also collaborate with other members of the communications team. The service has been recognized for outstanding achievement in educational communications by the New York School Public Relations Association, National School Public Relations Association and Association of Marketing and Communication Professionals. For more information on how to customize a communications plan for your district contact Dan Sherman at (518) 477-8771 or dsherman@questar.org.